Obama Questions Trump's Knowledge About Foreign Policy And 'The World Generally' : The Two-Way President Obama said Donald Trump's statements on nuclear issues show he "doesn't know much about foreign policy, or nuclear policy, or the Korean Peninsula, or the world generally." 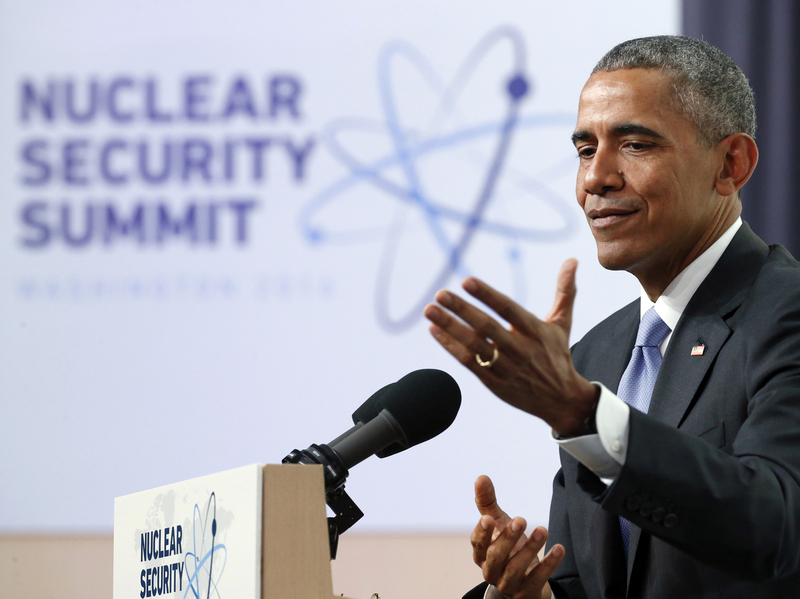 President Obama speaks during a news conference at the Nuclear Security Summit on Friday in Washington. Without directly naming Donald Trump, President Obama said Friday that the candidate's statements on nuclear issues show he "doesn't know much about foreign policy, or nuclear policy, or the Korean Peninsula, or the world generally." The president made the comments during a news conference after the nuclear security summit in Washington. Obama was answering a question from a reporter about comments that Trump made earlier this week in which he suggested that Japan and South Korea should have nuclear weapons to protect themselves so the United States does not have to pay for their protection. As the Washington Post reported, foreign leaders expressed confusion and concern about Trump's remarks. "We are dumbfounded at such myopic views of a leading candidate in the U.S. presidential race, who tries to approach such critical issues only from the perspective of expenses," the JoongAng Ilbo, one of South Korea's biggest newspapers, said. "Trump must refrain from his penny-wise and pound-foolish approach." The Post also reported that "in Tokyo, Yoshihide Suga, the chief cabinet secretary, said there would be no change in Japan's policy of not having nuclear weapons." Obama emphasized the value of protecting Asian allies. "Our alliance with Japan and the Republic of Korea is one of the foundations, one of the cornerstones of our presence in that Asia Pacific region. It has underwritten the peace and prosperity of that region. It has been an enormous boon to American commerce and American influence and it has prevented the possibilities of a nuclear escalation and conflict between countries that in the past and throughout history have been engaged in hugely destructive conflicts and controversies," he said. "So you don't mess with that." "We don't want somebody in the Oval Office who doesn't recognize how important that is," Obama added. Earlier in the week, Trump also said he wouldn't rule out using nuclear weapons in Europe or the Middle East, as NPR reported. "I would never take any of my cards off the table," Trump said in a town hall meeting on MSNBC. "People pay attention to American elections," Obama said about Trump's comments. "What we do is really important to the rest of the world."